Happy Thanksgiving week, errbody! Otherwise known as Eat Week! Say, do you have your menu selected and coordinated and spreadsheeted yet? I don’t. Because I don’t have to cook Thanksgiving dinner, suckas! But perhaps you do have the big job this year, or maybe you need to bring a dish to a gathering. I get it. And if that’s the case, may I humbly suggest that you consider today’s recipe? It’s one of the most quintessentially “fall” dishes there is, guaranteed to perfectly fit in the Thanksgiving spread: roasted butternut squash! I had never made a butternut squash until a couple of weeks ago. Honestly, I’d never been interested in trying it, despite the butternut buzz this time of year. See, my family always prepares a yellow squash casserole for Thanksgiving dinner, which I skip because I find it slimy and not to my taste. So why try a butternut when I don’t like squash? Because Mr. P suggested it. He doesn’t remember it, but he did, because there’s no way that I’d get a butternut squash on my own whim, and also because if he remarks that he’d like to eat something (FOR ONCE IN HIS LIFE) I remember, dang it. So I went to the farmer’s market at work... no. Back up. 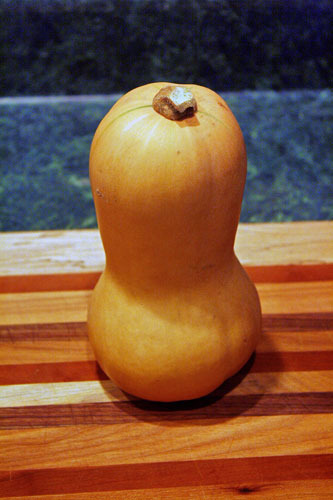 First, I Google-image-searched to find out what butternut squashes look like, so I could confidently purchase one from the farmer’s market at work. Pro tip: they look like this. Anyway, once I got that butternut squash home, I sized it up and realized... I had no idea what to do with it. What, my obligation to Fall Spirit wasn’t fulfilled just by purchasing one? Hmm. A bit more searching revealed this recipe, which sounded tasty but was useless the night I actually prepared the squash because our internet was broken. Which meant.... I had to figure out how to dice this thing up all by myself. Huh. So, I lopped off the top and cut it in half. Seemed like a decent start, eh? Fair warning: the innards have that gross pumpkin smell. Not pretend-pumpkin smell, which everyone enthuses over at this time of year but is actually, like, just cinnamon sans pumpkin. Actual pumpkin is sort of pungent and earthy and gross, and the butternut squash is similar. But don’t let that deter you! The smell goes away with the seeds and while roasting, and ultimately it will taste way better than that smell. Promise. I still didn’t know what I was doing, so I cut the half into fourths. Then I scraped out the seeds, because that seemed appropriate? Finally I gave up and just started hacking it into similarly-sized pieces, then trimming the peel off of each piece. 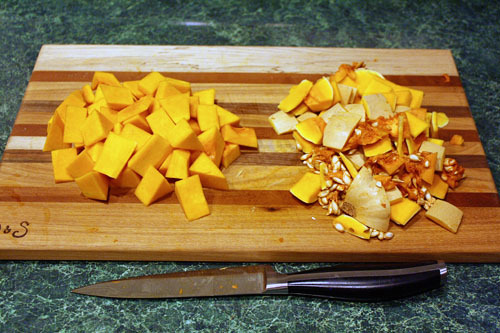 Squash bits on the left, peel and seeds on the right. Or you could use a vegetable peeler like this page suggests, but I don’t have one. A knife did the job well enough. So there! It’s a bit easier to scoop the seeds out this way, too. Either way! 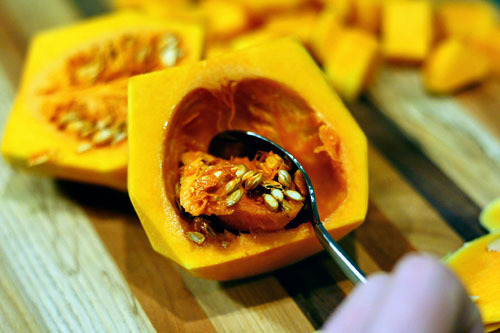 Do what you gotta do to remove the peel and the seeds from the squash, then dice it up. 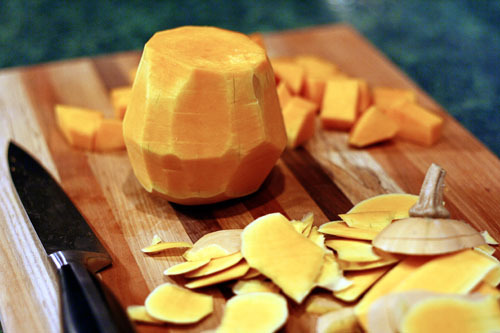 By the by, why does everyone claim they are “cubing” the squash? It’s so oddly shaped, there’s no way I could cut it into cubes. They were more like pyramids-ish. I dodecahedroned it, maybe. Whatever, so long as they were similarly sized to roast equally is all that matters! Speaking of roasting. 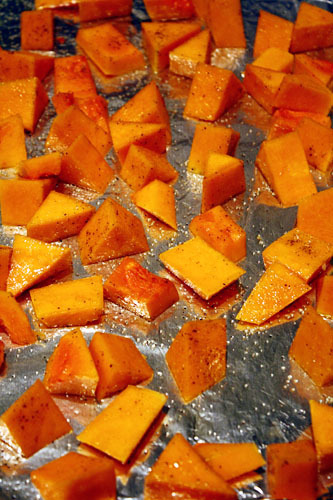 Once the squash is tetrahedroned, spread it on a baking sheet, drizzle with olive oil, and sprinkle with salt and pepper. You could totally add more seasonings if you want – a savory mix of garlic powder and parsley, or go for sweet with brown sugar and cinnamon. I was a purist and stuck to just salt and pepper, but I think both of those flavor profiles would be great. 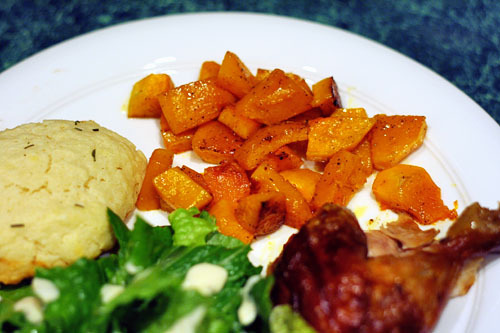 Butternut squash tastes – to me – remarkably similar to sweet potatoes, so go with whatever seasoning you like with those! 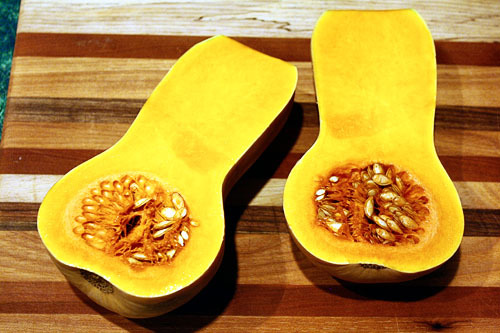 Once the squash is oiled and seasoned, pop it in a 425-degree oven for about twenty minutes. That’s it! So easy! You can click on the broiler at the end if you want to make the squash a bit crispy (I didn’t, but I think it would be good). Roasted squash! There are few things that look more like a fall food than that, right? And I’m happy to report that it’s nothing like the yellow squash casserole I feared. This is an excellent side to complement any fall meal (we had it with rotisserie chicken, salad, and drop biscuits), but I think it would be great for the Thanksgiving menu! The only downside is that the dicing can take a little time, but if, like me, you enjoy chopping vegetables, that’s not really even a downside. And if you have leftover squash – well, I’ll have something for that next week. 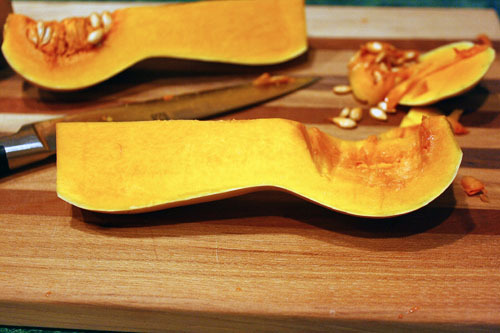 Hope you have a chance to try roasting a butternut squash before fall fades entirely! Enjoy! You know who taught me all there is to know about butternut squash? MP!